Kathy and Floyd - A Cokesbury Church / Hunter Valley Farm Christmas Wedding from NICHOLAS & KEATON on Vimeo. Some people ask us random questions about highlight films. One in particular is "Why do you show the pastor/officiant speaking instead of the couple speaking?". Sometimes there are various reasons behind it....such as story, clean audio, or just cinematic flow... but this time the pastor is featured because it meant something to the couple. The pastor speaking in the film is Kathy's father. 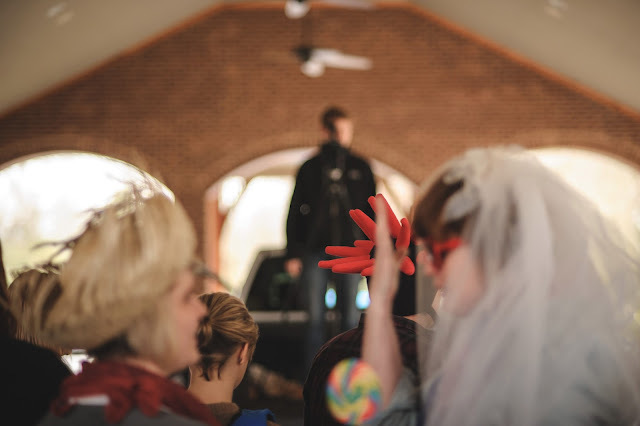 He is the former pastor of Cokebury United Methodist Church in Knoxville, TN, so Kathy's special day meant SO much more to her, because of her father... watch the film and you'll see how amazing their special day was for us all! Karina and Jimmy - A First United Methodist Church / The Country Club Wedding in Morristown, TN from NICHOLAS & KEATON on Vimeo. Opal and Stacey - A McConnell House Wedding in Franklin, TN from NICHOLAS & KEATON on Vimeo. There are so many words we could use to describe Opal & Stacey's wedding day, but really you just need to watch the film. We can't put into words how emotional, loving, caring, and sweet these two are towards each other... It's crazy. When you're around these two, it's like watching one of those old school love story movies on Lifetime! Seriously, it's so awesome to see a couple who is so amazingly attached to each other on so many levels. Their wedding at the McConnell House in Franklin, TN was stunning. When we first saw the venue on pre-wedding meeting trip, we knew it was going to be amazing. Believe it or not, the McConnell House is actually the old Franklin, TN jail! They've converted it into one of the most unique and awesome wedding and event venues in the Nashville area! Definitely check it out if you're looking for a super unique Nashville wedding venue! 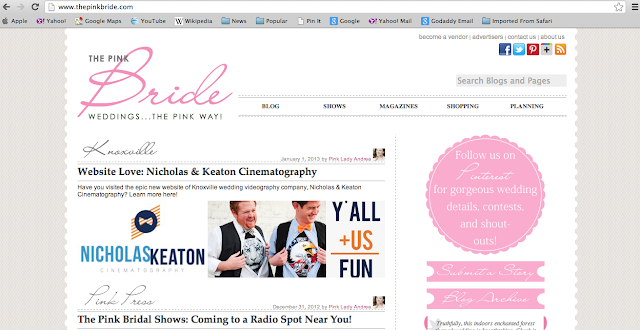 Scott & Bridgette - A Legacy Farms Wedding in Lebanon, TN from NICHOLAS & KEATON on Vimeo. Bridgette and Scott's wedding... well.... let's just say we've been waiting over a year for this AMAZING wedding, and it was everything we anticipated...AND MORE! From awesome socks, an amazing first look, wonderful friends and family, to some of the best wedding food we've ever eaten... this wedding had it all! Legacy Farms is an absolutely spectacular place to have a wedding! They have several venues wrapped into one big venue, which can suit several weddings a day, but you get the feel of a very intimate special wedding event. It's awesome. We absolutely LOVED filming there! Alicia and Blake - A Mountain Cove Farms Wedding in Chickamauga, GA from NICHOLAS & KEATON on Vimeo. Sounds like the next Nicholas Sparks movie right? Well, it pretty much was! Alicia and Blake's amazing country chic wedding was everything anyone could ever want in a perfect wedding. Alicia and Blake are not only so madly in love they kinda make you jealous, but they also have an amazing family and friend network that would make the Queen of England jealous! And trust us... their friends and family know how to have a great time! From tears of love to tears of hysterical laughter, this wedding film has it all! Be sure to check out the "horse and squirrel" outtakes at the end... yes.... just watch. Thanks Alicia and Blake for letting us share your special day with you! We love you both and we're so blessed to be able to call you friends for life. Bridget & Adam - A Knoxville Zoo Wedding from NICHOLAS & KEATON on Vimeo. Ana and Rosendo - A St. John Neumann's Catholic Church / Bleak House Wedding from NICHOLAS & KEATON on Vimeo. Ana and Rosendo (or should we say "Ana y Rosendo"). Words can't describe this wedding. Seriously. Two gorgeous models (also known as the bride and groom), a spanish influenced catholic church, a mariachi band, and authentic mexican cuisine. Truthfully, we wish Ana and Rosendo were having a wedding every weekend! We'd be there! Check out this AMAZING wedding... speechless. Seriously. Laura Lynn & Devin - A General Morgan Inn Wedding in Greeneville, TN from NICHOLAS & KEATON on Vimeo. We'll just say it like this... we haven't been to a more spirit filled wedding ever. Period. Laura Lynn and Devin's wedding was simply awesome. Being that we are Christians, who openly share our faith with others, it was awesome to see Laura Lynn and Devin share their faith with their wedding guests. They even had a couple of praise songs AND an invitation during the ceremony! How cool is that?? We were honored to be a part of their day, and we will cherish those moments each and everyday. Natalie & Doug - A Carnegie Hotel / The Charles Wedding in Johnson City, TN from NICHOLAS & KEATON on Vimeo. Natalie and Doug's wedding was absolutely spectacular!!! 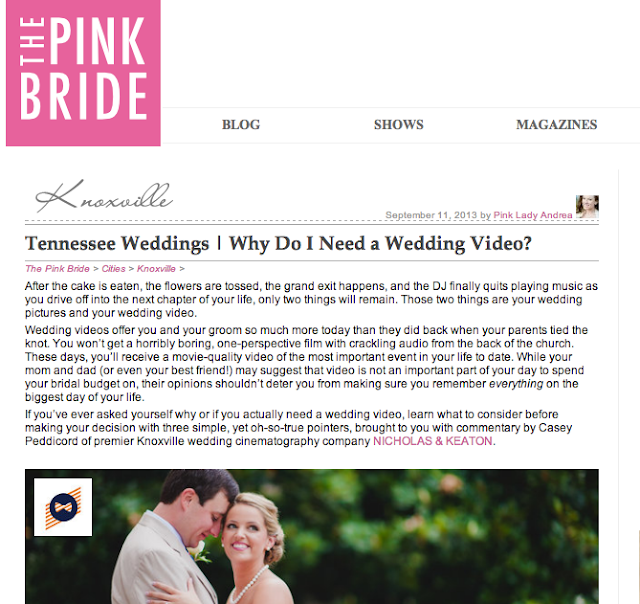 It was the first wedding we've filmed in the tri-cities area of Tennessee. Johnson City's venue The Charles blew our socks off! Natalie and Doug's reception there was incredible... the food, the drinks, the super cool dance floor, and just the overall atmosphere really made for a great time! Natalie and Doug have such an amazing story, and we were so blessed to be able to capture their wedding day on film! How in the heck did you get that shot? Do you really love bacon as much as you say you do? Were you using a crane or something? That's so cool!.... how'd you do it? So, we thought we might discuss a little bit about a recent shoot we did at The Believe Workshop. We had a bunch of awesomely crazy photographers, a truck full (literally!) of random props (lifejackets, lamp shades, a duck, a strangely large umbrella, a watergun... yes the list goes on and on...)... so we couldn't pass up the chance to do the Harlem Shake! Joe Atkins, with JOPHOTO, brought the idea to us and we were like "ummmm yeah... FOR SURE....". The video, which was shot at Smithview Pavillion in Maryville, TN, seems to be shot from "up in the air", as if we're looking down at the photographers. Many people think you need a crane, a really expensive ladder, or some other sort of insane filmmaking tool to accomplish this look. Well, we're here to tell ya YOU DON'T! So, in the hills of East Tennessee, EVERYBODY has a truck. I (NICHOLAS) have a full size Nissan Titan. So, why not put it to good use! We backed that baby up right into the middle of the pavilion and Keaton shot the whole production out of the bed of the truck. Yep, we simply put a tripod in the middle of the bed of the truck. So simple, yet so effective. We got the shot we wanted, and we never had to setup a crane or ladder or anything else. Check it out! 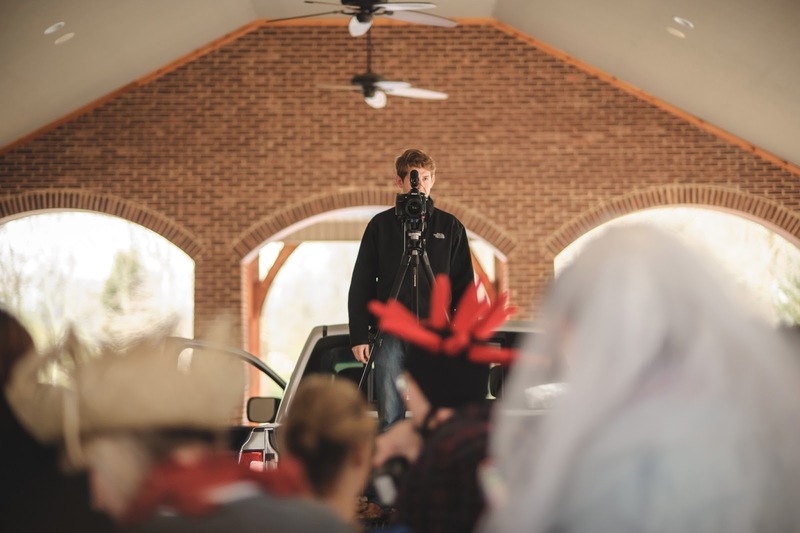 A huge shout out to Jimmy Phillips with Perfect Capture Photo for getting these super cool shots of KEATON filming the Harlem Shake!